I've heard that most people either love or hate the IPhone. I, for one, love my IPhone and I'm glad I bought one. Buying the IPhone was one splurge I don't regret. In addition to the default apps that come with the IPhone, there are hundreds of helpful and fun applications you can download for free. White Pages. Easily look up a phone number for any person or business in the country. Someone call you but you don't know the number? You can also do a reverse search to find out who a number belongs to. Around Me. No matter where you are, you can easily find the nearest bank, coffee shop, gas station, hospital, hotel, movie theater, restaurant, supermarket, taxi or pharmacy. This app was very helpful when I was working in Houston for three weeks and needed to find nearby services. CNN. Breaking news from around the world and breaking financial news. Bloomberg. If you like to watch the market, this is the application for you. Keep track of the equity indices of America, Europe, Middle East, Africa and Asia. The Weather Channel. Easily find weather information for your location. The application allows you to view the current radar and see the latest weather alerts for your location. Ibowl. This is one of my favorite games to play. Swing your IPhone to send the bowling ball down the lane. Facebook. If you are big into Facebook, there is an app to keep you up to date on your Facebook page. IPhunny. Need a good laugh, Iphunny is it. Most of the jokes are from a political standpoint and most of them are from Jay Leno. Jimmy Kimmel and Conan O'Brien. UrbanSpoon. Can't decide where you want to eat? UrbanSpoon is the greatest app for you. Shake your phone and the app finds restaurants in your area. The app lists restaurants by location, type of food and by cost. Shazam. This is one of my favorite apps so far. You know that song you hear and you don't know who sings it? With Shazam, you hold your phone up to the song and within a few seconds, it will tell you the artist, title of the song, album and also give you the option of locating the song on Itunes. 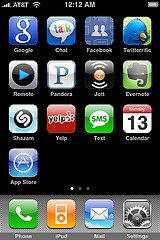 If you own an IPhone, what are you favorite IPhone Apps? Thanks for these - I emailed your post to my wife who is addicted to her iPhone. So glad these are free!